We miss Jan so much. Her smile, her giggle, her sense of humor. A huge gaping hole has been left and we are left trying to understand why. No one can ever replace Jan, just as no one could ever replace her mother. Now they are together again at last, their bond was unbreakable, Jan simply could not go on any longer without her mum's steadying hand and guidance. We will keep them both alive in our memories. 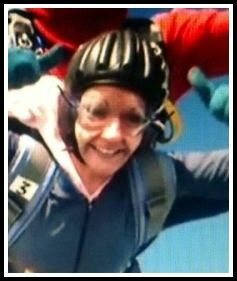 In this picture Jan was having one of the most wonderful moments of her life, sky diving. She kept saying she wanted to do it again. Now she can fly among the clouds whenever she pleases. Rest in Peace, dear Jan. You will never be really gone as long as you are never forgotten.